The head of Terahertz Biomedicine Lab Dr. Mikhail Khodzitsky was awarded by St. Petersburg Government in the field of scientific and educational activities. 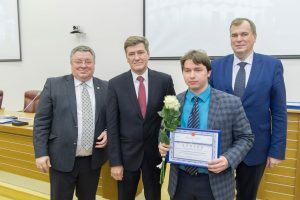 This award confirms the significance of his authorial course “Terahertz spectroscopy” which has been taught at ITMO University since 2017 year in spring semester. This course is devoted terahertz emitters and detectors, time-domain spectroscopy and their applications in investigations of materials. Terahertz Biomedicine Laboratory © All Rights Reserved.